Former Manchester United striker, Wayne Rooney and wife, Coleen Rooney have welcomed their fourth son. The excited wife of the Everton star and former England skipper announced the good news on her Twitter account early on Thursday. 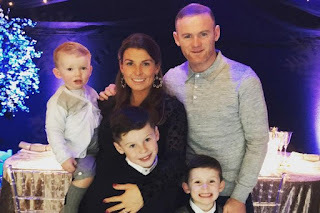 Wayne Rooney, 32, and Coleen, 31, who got married in 2008, are already parents to Kai, 8, Klay, 4, and Kit, 2.